Soil scientists hope to establish a nationwide network of educational soils sites – with help from geoconservationists. Over the last year, leading figures from the soils science community have held teleconferences with their counterparts in the field of geoconservation. The GT was their first point of contact, because of the project that we developed to give our members an introduction to soil surveying in 2009. These teleconferences have brought together people from the length and breadth of the country, based in Exeter to Aberdeen, from organisations including Natural England, the Environment Agency, Cranfield University and several other universities, British Society of Soil Science, Scottish Natural Heritage, The Geology Trusts and GeoConservation UK. The discussions considered the purpose for, and likely users of a soils site network, and ways to protect and promote sites. 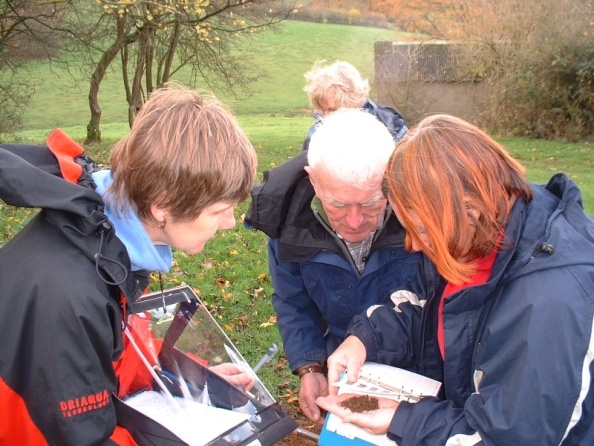 The obvious means of protecting soils sites is through the use of the ready-established Local Sites system – designating soils sites as Local Geological Sites (LGS) within the planning system, soils already being a recognised part of geodiversity. 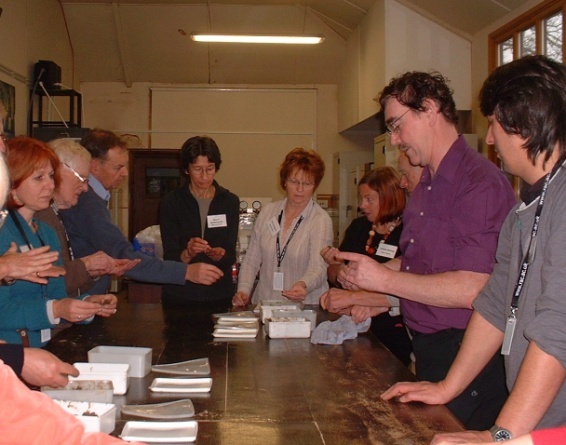 In May 2012, everyone finally met up for a day workshop at the Royal Agricultural College in Cirencester, to develop guidance on the selection of soils sites. It is hoped that this can be launched later in the year through a series of regional workshops that will bring together and enthuse local soils and geoconservation practitioners. Such an event has already been held very successfully in the South-West region. Look out for the event near you! Above & above right: Members of the Geology Trusts received soils training from experts John Conway and Ian Fenwick in November 2009.